Eight years ago, impoverished gentleman's daughter Marianne Redfern fled her Lincolnshire home when her first love was forced to wed another. 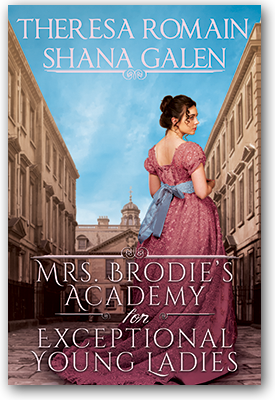 At Mrs. Brodie's Academy, she learned the arts of cookery and self-defense—and as head cook, she can manage her staff, feed hundreds, and take down thieves. But she has no defense against Jack Grahame's unexpected arrival two weeks before a dinner that will secure the academy's fortunes. Caleb Harris is a man with a price on his head. He knew his work during the war was dangerous, but he didn't think it would haunt him the rest of his life. Before he left for the war, he and Bridget had a passionate affair. Finding her again means everything to him. He wants to help her and he definitely still loves her, but loving her might just be too dangerous for either of them. 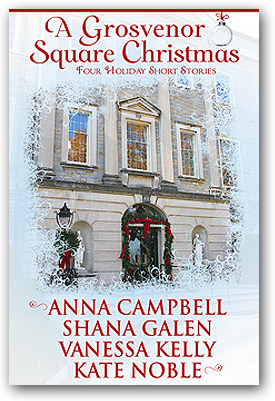 "Stealing the Duke's Heart is a compilation of two novellas by the fabulous Shana Galen. Whether you have read these stories or not, just one look at that amazing cover will convince you to read them, or reread them; do judge this book by the cover!" When Henry Selkirk, Viscount Bexley, is proclaimed the Prince Regent's Master of Ceremonies for His Highness's birthday celebration, Henry wonders what he ever did to deserve such punishment. Taxed with curbing the extravagant prince's spending, Henry juggles the prince and the difficulties of preparing the venue, Vauxhall Pleasure Gardens. While touring Vauxhall, Henry encounters a gang of thugs and is taken prisoner by a disreputable criminal who calls himself the Duke of Vauxhall. The pleasure gardens are the duke's domain, and he wants Henry gone. For good. When Kate Dunn sees Henry Selkirk again, she hardly dares to believe her first love will remember her. It's been years since the two played as children together on the streets of London. She uses her influence to see him set free from the Duke of Vauxhall's clutches, but when Henry refuses to give up his position at Vauxhall Gardens, his days are numbered. To add insult to injury, Henry warns Kate that it's she who's running out of time. He knows her secret, and once the gang finds out, she's as good as dead. As the night of Kate's greatest heist ever approaches, she must choose between failing the gang and losing her life or disappointing Henry and losing her only chance at true love. Dominick Spencer, the Duke of Tremayne, is a powerful man used to having his way. When he sets out to find the lost volumes of The Duke's Book of Knowledge to present to his favorite Oxford professor, Dominick takes his task seriously, even hiring a cat burglar to help him gain entry to a remote castle in Cornwall inhabited by a mad earl. Rosalyn Dashner knows accepting the duke's assignment is dangerous, but her impoverished family and sick brother need the money. The daughter of a gentleman, Rosalyn is not impressed by titles. She's not impressed by the haughty duke until she comes to know the kind but lonely man under the gruff exterior. 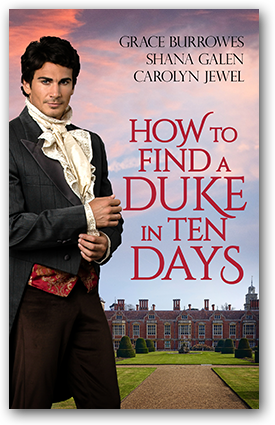 The duke might be looking for a manuscript, but she's found a man she loves. When Rosalyn must risk her life to obtain the manuscript, will Dominick choose her or his quest for the Duke's Book? These novellas were previously published in the anthologies The Dukes of Vauxhall and How to Find a Duke in Ten Days. For centuries, the volumes of a priceless Renaissance manuscript, The Duke's Book of Knowledge, have been the subject of legend and rumor. Three members of London's Bibliomania Club have promised a beloved professor they'll find the manuscripts before the professor retires. They are determined to vindicate his faith in the Duke's existence while rescuing a great literary work from obscurity. The problem? The book must be found in ten days. Matters of the heart intrude as each book hunter realizes that locating an ancient manuscript might just lead to happiness ever after. Dominick Spencer, the Duke of Tremayne, is a powerful man used to having his way. When he and two other members of the Bibliophile Society set out to find the lost volumes of The Duke's Book of Knowledge to present to their favorite Oxford professor, Dominick takes his task seriously, even hiring a cat burglar to help him gain entry to a remote castle in Cornwall inhabited by a mad earl. Four dukes. Two balls. One prizefight. Vauxhall Pleasure Gardens will never be the same. When Henry Selkirk, the newly elevated Viscount Bexley, is proclaimed the Prince Regent's Master of Ceremonies for His Highness's combined birthday and Victory at Waterloo celebration, Henry wonders what he ever did to deserve such punishment. Taxed with curbing the notoriously extravagant prince's spending, Henry juggles the prince and the difficulties of preparing the venue, Vauxhall Pleasure Gardens. While touring Vauxhall, Henry encounters a gang of thugs and is taken prisoner by their leader, a disreputable criminal who calls himself the Duke of Vauxhall. The pleasure gardens are the duke's domain, and he wants Henry gone. For good. When Kate Dunn sees Henry Selkirk again, she hardly dares to believe her first love will remember her. It's been years since the two played as children together on the streets of London. She uses her influence to see him set free from the Duke of Vauxhall's clutches, but when Henry refuses to give up his position at Vauxhall Gardens, his days are numbered. But Henry warns Kate that it's she who's running out of time. He knows her secret, and once the gang finds out, she's as good as dead. As the night of Kate's greatest heist ever approaches, she must choose between failing the gang and losing her life or disappointing Henry and losing her only chance at true love. Nathan Cauley, Duke of Wyndover, is so handsome ladies swoon—but Nathan doesn't want a fawning miss for his duchess. Then he stumbles upon a filthy young woman sleeping under a bridge, and his protective instincts are raised. When he recognizes her as the woman he loved years before, he's determined to win back her heart. Princess Vivienne is the last of the royal family of Glynaven. Vivienne is all alone and on the run when the Duke of Wyndover comes to her rescue. Vivienne barely remembers meeting him years before, and wonders if he is any more than a pretty face. But when the assassins return, Nathan might just prove to be the man Vivienne's been waiting for. Prince Lucien of Glynaven spends the cold winter days in a small bookshop, searching for a book that's the key to saving his life. When Lady Cassandra Ashbrooke comes in to shop, her lovely face is almost enough to make him give up his search. But when assassins track him, he must end the budding romance and abandon his last chance at ever reclaiming his identity. A prince is just the man to make Christmas a little more cozy. When the widowed Lady Cassandra catches a glimpse of an attractive man in her favorite bookshop, she decides to meet him, hoping to add a small spark of excitement into her dull life. Soon the prince's kisses are more passionate than Cass can imagine. But with danger closing in on all sides, is it too late for a holiday miracle? These novellas were previously published in the anthologies Dancing in the Duke's Arms and Christmas in Duke Street. "The Seduction of a Duchess" is a Sons of the Revolution short story.